Giveaway : An UglyChristmasSweater worth $50! Even though we are only mid way through November, I know that many are already prepping for Christmas. Time usually flies, as days turn into months and before you know it, it would be Christmas. So, here is an ugly Christmas sweater giveaway that will get you Christmas ready 🎅! The giveaway is sponsored by UglyChristmasSweater.com. They have an amazing variety of sweaters and have been featured on The Today Show, Live with Kelly and Ryan, Good Morning America, and the Ellen Show. They’re also a national partner of charity organizations, such as Toys for Tots, Arthritis.org, and the Smithsonian Zoo. Whether it’s a creative, humorous, naughty, 3D, custom made or downright ugly sweater that you are looking for, this site stocks it. Whether you’re attending an Ugly Sweater Contest or just going to your family Christmas dinner, you should definitely check out their wide variety of sweaters to choose from. They create original designs for everyone. The giveaway is open to all my US based followers. Winner will get to choose an ugly sweater worth upto $50 from the site. . Rules are simple. Just fill out the rafflecopter below 😊. There are only two mandatory steps on the giveaway form but the more steps you complete, more will be your winning chances. This giveaway will end on Dec 1st & the winner will be selected at random and announced on Dec 3rd. Also, they don’t just carry ugly sweaters, they are the de facto one-stop hop for Christmas clothes that are silly, outrageous, obnoxious and funny. This piggyback ride costume below has got me laughing!. It’s so cool 😂. Definitely check out this site, you guys! 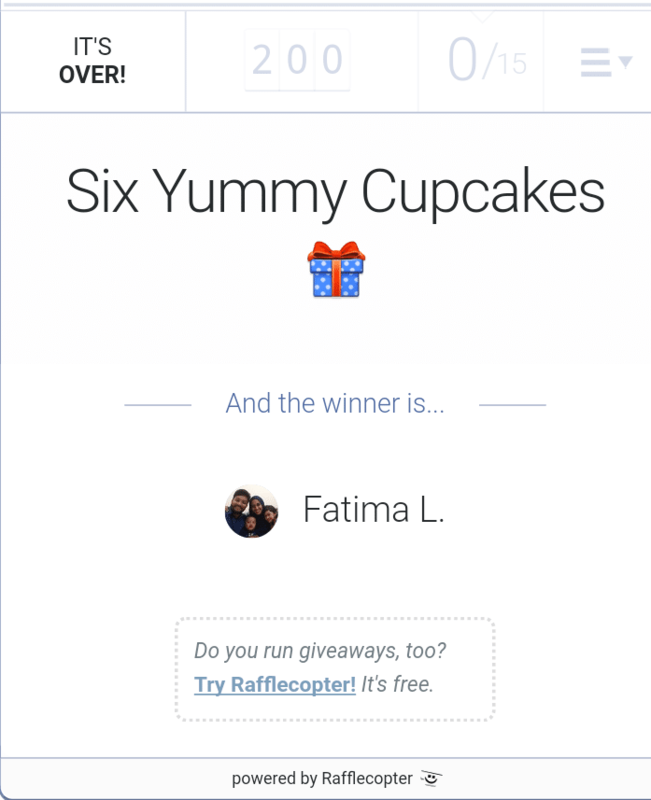 Giveaway Winner of Cake Rack Cupcakes! The Cake Rack cupcakes giveaway saw a lot of entries. A total of 200 entries which is great! The extremely lucky, random winner is Ms Fatima Lamyae. Review & Giveaway : Red Velvet Cake from Cake Rack! My friend, Jeena Asghar, is a creative cook & baker. I have had the chance to taste her dishes several times. So, recently when she mentioned that she has started a business called Cake Rack, I was overjoyed. More than being happy for her, I was happy that others could taste her creations too! Recently she created a Red Velvet cake with cream cheese frosting, especially for me since I love Red Velvet cakes. Let me tell you this, red velvet can be created in many ways but the classic way is to combine it with a layer of not just cream but a cream cheese frosting. She does that absolutely perfectly. Just look at how defined & moist those layers are!. It had just the right amount of sugary kick with the deliciousness of cheese. Yum!. I actually got a spoon and finished off the cake after cutting off a layer of it for the purpose of this review!. It was that heavenly. So tasty, that I was craving for more, the moment it got over… The cake was topped with pretty & colorful flowers that were made with sugar. Next time you are in need of a cake for an occasion or you just wish to treat yourself to something special, remember Cake Rack. She can do creative, unique and customized designs as per your liking. Hop on to her FB page to get all information on how to order, the directions to her place and most importantly, amazing pictures of the cakes she has created so far..
● There are only 3 mandatory entries, rest are optional but the more entries you complete, more are your chances to win. ● Giveaway is open to UAE residents. However, since Cake Rack is based in Abu Dhabi, enter only if you or someone related to you are in Abu Dhabi. ● If the winner is within the town area, the prize will be delivered to you by Jeena. If you are not within the area that she covers usually, you will have to pick up the prize. Once your (winner) address is disclosed to me, I will check with her if she can deliver to you. ● Giveaway will end on Jan 8th and the winner will be announced on Jan 10th on my blog and Facebook page. Now that you have satisfied your eyes, here is a chance to satisfy your taste buds.. Click the button below to ‘log in’ to the giveaway form via email (You won’t be signed up for anything). Giveaway Winner of $50 Gift Code to Jord Watches! Smitha Vinod is the winner of $50 gift code that can be used to buy a fantastic wooden wrist watch from Jord Watches. Winner, please email me at nazninazeez@gmail.com to claim your prize. Giveaway : $50 Gift Code to buy a Jord Watch (Open Worldwide)! I recently came to receive a $50 gift code to spend at Jord Watches. It’s a freaking amazing site and they have wooden watches. They are gorgeous. They ship worldwide. ● Subscribe to my blog by clicking the “Follow me by email” and confirm your subscription by clicking the activation link sent to your email. ● Leave a meaningful comment on this post. All names in the comments will be put into a draw and a random winner will be picked using random.org. I will let this giveaway run until Dec 6th. That’s 1 week. Winner will be announced in a post on Dec 7th. The gift code expires on Dec 31st, so you will have plenty of time to make your purchase. Kindly share this giveaway with anyone whom you think would love to buy a fantastic watch. Parenting Healthy, Easter Babe’s TheoryAging Like a Fine Wine, Shabby Chic Boho, and Lake Hartwell Agent. THANK YOU for participating and good luck, my dear friends and followers! Disclosure: The bloggers involved in this giveaway were not compensated, and are not responsible for prize fulfillment. Lil’ Blog and More will be sending the prize out. Must be 18 years of age or older to enter this giveaway. This giveaway starts September 5th, 2017, and will end on September 30, 2017 at 11:59 pm. The winner will be emailed, and have 48 hours to respond, or a new winner will be chosen. Once a winner is drawn and confirmed, the name will be announced on the GiveawayTools form. Open to Worldwide entries. Giveaway Winners : Makeup class at DHD Beauty School, Dubai! Congratulations goes to these two extremely lucky ladies for winning a spot in a group makeup class by award winning hair and makeup artist, Dahlia of DHD Beauty school in Dubai!. First prize winner is Jemsheena Yoosuf who gets to choose to learn any one of the following three – Bridal makeup, Glam evening makeup look or Everyday daytime look. Second prize winner is Adiba Khan who gets to choose to learn one of the two remaining looks that weren’t chosen by Jemsheena. Both winners please email me at nazninazeez@gmail.com so that we can discuss & take this further. Giveaway winners of ebook Drasine! 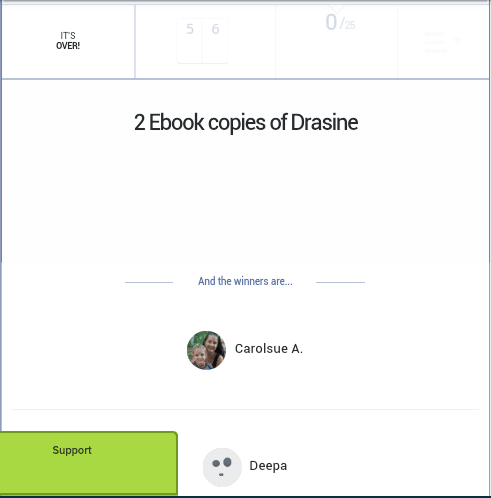 Congratulations goes to Carol Sue Anderson from US and Deepa from India for winning a copy each, of Geoffrey Saign’s amazing ebook, Drasine, in a format of their choice!. Winners, please reply to the emails that I have sent out to you.. 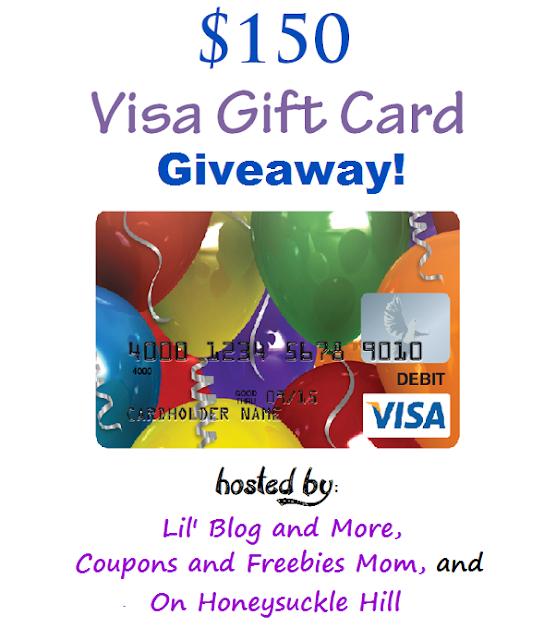 Giveaway : $150 Visa Giftcard (Open internationally)! This event is hosted by: Lil’ Blog and More, Coupons and Freebies Mom, and On Honeysuckle Hill. Disclosure: The bloggers involved in this giveaway were not compensated, and are not responsible for prize fulfillment. 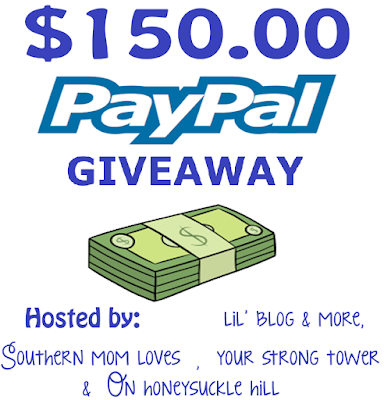 Lil’ Blog and More will be sending the prize out. Must be 18 years of age or older to enter this giveaway.This giveaway starts March 23, 2017, and will end on April 21, 2017 at11:59 pm. The winner will be emailed, and have 48 hours to respond, or a new winner will be chosen. Once a winner is drawn and confirmed, the name will be announced on the GiveawayTools form. Open to Worldwide entries.